How to Use SQL UPDATE .. RETURNING to Run DML More Efficiently – Java, SQL and jOOQ. SQL Server doesn’t allow to use aggregate functions in OUTPUT. –>> An aggregate may not appear in the OUTPUT clause. Great article Lukas! I was aware that updating data row-by-row inside a loop was usually worse than performing an update as a set, but it’s good to have some examples with runtime comparisons. 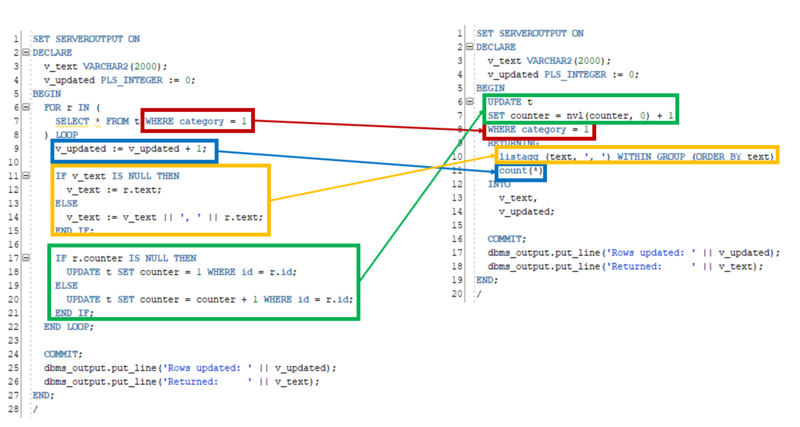 Also the side-by-side comparison showing how the logic has moved between both versions of code is very helpful. Thanks! Thanks for the nice words, Ben. Indeed, that side-by-side comparison is a thing I had wanted to try for a while. It’s very suitable to compare imperative and set-based algorithms.